Charles Spearman anonymously sued four Catholic priests from the St. Louis area on the grounds that they sexually molested him while attending parochial schools as a child. Spearman alleged that Father James Theil, Father Michael O. Barry, Father Chester "Chet" Gaiter and Father Thaddeus Posey, all formerly of Cardinal Ritter College Prep High School, sexually abused him. In late April, Gaiter, Barry and Theil settled for $140,000. Parties to the settlement included the Jesuits of Missouri Province, the Redemptorists Denver Province and the Archdiocese of St. Louis. Spearman's federal case against Posey is still pending. 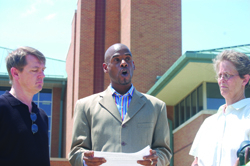 SNAP National Director David Clohessy stands with Charles Spearman who was sexually abused by four priests as a child addresses the media last week in front of Cardinal Ritter College Prep about his settlement. At right is SNAP Victims Outreach Coordinator Barbara Dorris. While he offered his story to Jet magazine earlier this year, Spearman spoke publicly about his alleged abuse and the lawsuit settlement last week in front of Cardinal Ritter. "If it were not for me, no one would know this," Spearman said. Citing the fact that every U.S. bishop had pledged to be "open and transparent" concerning clergy sexual abuse, he criticized Archbishop Raymond Burke and other Catholic officials for remaining silent about his molestation and the settlement with three priests. Also, Spearman said Burke remains silent regarding the whereabouts of a fifth accused priest who, according to Spearman, allegedly abused another boy at the school and was suspended in 2004. An Archdiocese spokesman, Monsignor Richard F. Stika, Episcopal Vicar for the Office of Child and Youth Protection, told Jet, "We participated in the settlement because the alleged abuse occurred on Archdiocesan property." Spearman said he has written a letter to Burke that requests "as a proposed man of God and the eminent leader of the St. Louis Archdiocese, that you honor your commitment to the protection of children and families by publicly announcing the names, whereabouts and status of each (alleged) perpetrator. This disclosure should be immediate and sincere. "The families whose children attended these institutions, as well as current students, have a need and the right to know this information in an effort to better protect children." After graduation, Spearman went on to obtain a bachelor's degree from Saint Louis University and a master's degree at Fontbonne. Spearman, who attended Notre Dame de Lores (K-2nd grade), St. Paul the Apostle (3rd-8th grade) and Cardinal Ritter, said the Catholic Church "took my parent's money and in turn raped, abused and molested me." Spearman alleged that Theil abused him from sixth to eighth grade at St. Paul. David Clohessy, president of the Survivors Network of those Abused by Priests (SNAPS), says his organization "believes the Catholic Church must come clean, as they have promised, and promptly disclose every credible abuse so kids are safe." Spearman, who cautions parents to think twice before enrolling their children in Catholic schools, says that he might write a book about his ordeal and the decision to file a lawsuit.